We created a rich setting and intriguing characters; once again I would love a mini-series to explore the setup! As it was, we established a trade agreement between the village and a dwarven mining settlement in the mountains, Ironbeard’s Rest, as well as ridding the dwarves of a minor demonic infestation. Derangements from the World of Darkness. I loved hearing the really good ideas people came up with to re-write the documents, maxing out the good ideas in the originals and mining the sources to replace the bad. It was getting late when we finished so I picked up my luggage, said goodbye to as many people as I could, watched the “award ceremony” for the winning fundraiser for the Tell Me About Your Character booth (Ryan got his belt back), and went home, exhausted but so proud to be associated with this community. 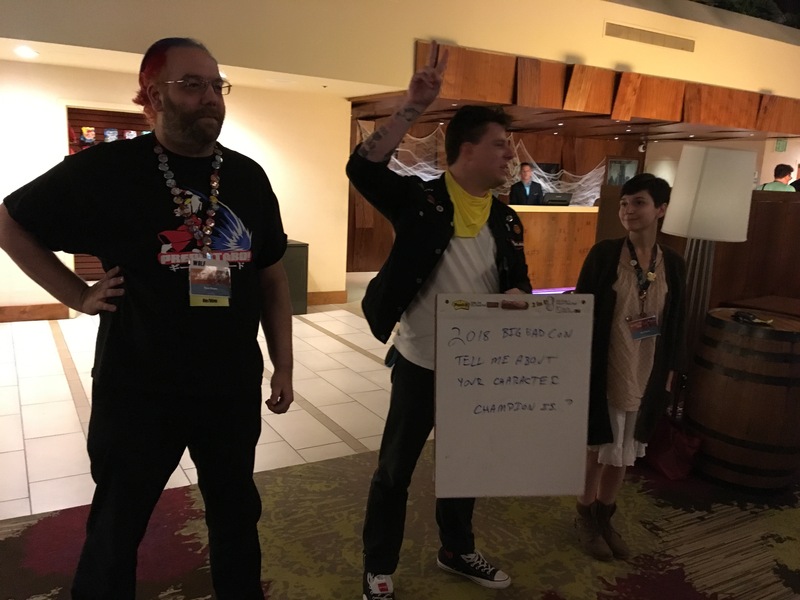 It was the third year that Big Bad Con was held at the Walnut Creek Marriott and had panels, Big Bad World, and games for teens; and the second year that we had a board game track and the current format for Games on Demand and that I really saw a lot of people coming from far away to attend the con. Until last year, attendees were mostly from the West Coast but now other time zones visit us! This was the year where I really saw the behaviours we want to encourage modeled by the community at large. For example, in every game I attended or saw kick off, the GMs talked about safety tools and explained them; they were not just a check box on the game submission form. Every attendee I saw at a game table checked for their table mates’ pronoun ribbons, then at character creation asked for the characters’ pronouns. Even when everyone present looked solidly cis-gendered. When talking about a player or their character in that player’s absence, people still used the correct pronouns! Oh, there were errors, I made some myself, but people would correct themselves, or accept gentle correction by someone else. I’m sure somewhere around the convention there were less benign misgenderings, but for the first time I did not see any myself. I saw more more openly non-gender-conforming attendees than ever before. In many cases, these were people who said they were shedding the disguise they had worn on previous years. They felt safe enough to be themselves at Big Bad Con. Others were newcomers who had been convinced by friends to give this con a try. I wish we had more persons of colour among attendees, and for that matter, a still higher proportion of women, but that too is improving. We also have a good number of attendees with disabilities who keep coming back because we try to reduce the barriers to their participation, and they felt welcomed. In short, the gamers around me looked more like the “real people” I see every day in the Bay Area than at any other convention. Less white, less male, less hatched from a narrow demographic stratum; more diverse in every respect. Starting on Thursday night, I heard so many people making introductions, checking in on the well-being of other attendees, providing directions, and so forth because they were playing Big Bad World. What struck me was some newcomers, elated because the playbooks were giving them permission to do these things rather than “minding their own business.” People did in fact easily withdraw when someone indicated they wanted privacy, but no one had to pretend that they didn’t notice someone else’s need for support either. At the end of the convention, people who I know came from a considerable distance and who have seen many conventions before were calling it the best they had ever attended. Honestly? I’m used to it by now, but they come from farther and farther afield. Posted on October 18, 2018 November 3, 2018 by mechanteanemonePosted in friends, games, rpgsTagged BayArea, BigBadCon, conventions, diversity, friends, games, gaming, LARPs, playtesting, rpgs, weekend.